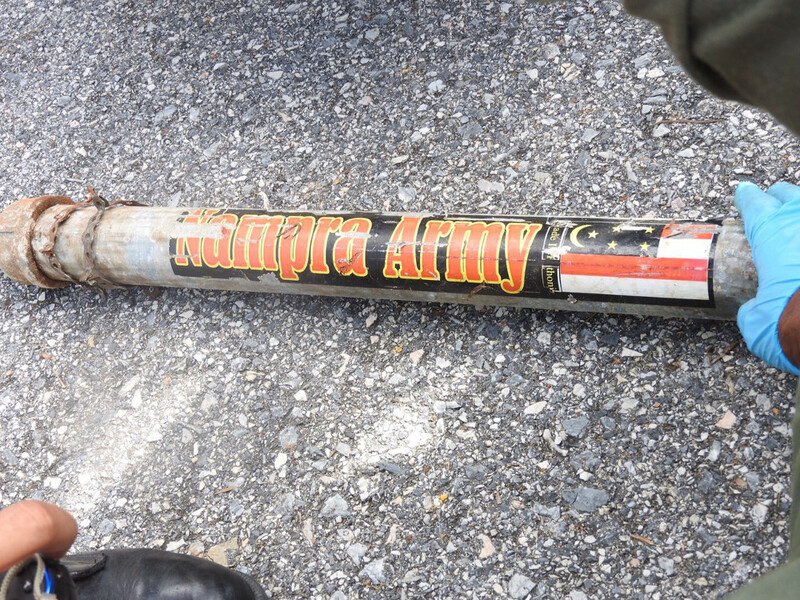 A bomb bearing the markings of the Nampra Army and the flag of the PULO rebel group was discovered in Nong Chik district, Pattani province, Jan. 30, 2016. The recent discovery of crudely made rocket-propelled weapons in Thailand’s restive Deep South signals that a smaller rebel group there is changing its combat tactics and may be trying to influence prospective peace talks, experts say. “They may want to show off that they have propelled bombs in order to leverage negotiation power,” a Thai counter-terrorism official who requested anonymity told BenarNews. He was referring to the Patani United Liberation Organization (PULO), one of the rebel groups that has been fighting a separatist insurgency in Thailand’s predominantly Muslim and Malay-speaking southern border region for more than a decade. Last year, PULO joined MARA Patani, an umbrella body representing various Deep South rebel groups in closed-door meetings in Malaysia with Thai negotiators, which have been aimed at resuming formal peace talks with Thailand for the first time since December 2013. It is significant that PULO has been taking credit via social media for the deployment of home-made rockets in the conflict zone, noted Zachary Abuza, an expert on the Thai Deep South who is a professor at the National War College in Washington, D.C.
“They’re clearly trying to stake out a greater role for themselves within MARA Patani and at the peace process,” Abuza told BenarNews. “The only way that they can do that is by staging attacks, but they have far fewer militants than the BRN. So they have to be creative to cause a stir,” he said. The BRN, or Barisan Revolusi Nasional, is the largest and most heavily armed of the Deep South rebel groups. 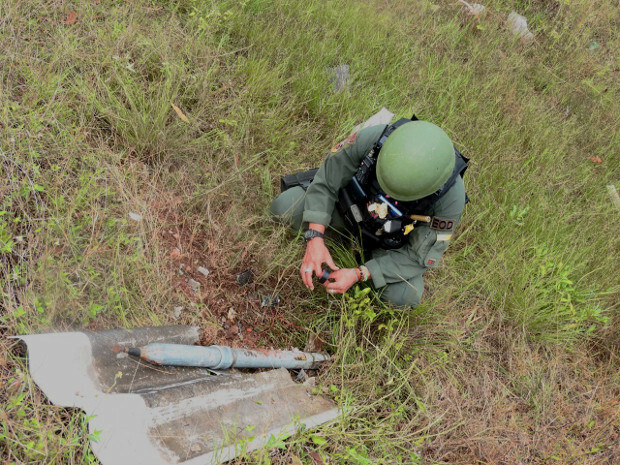 On Feb. 5, police in Narathiwat province found and disarmed a small rocket that was similar to rockets (pictured above and below) discovered last month in neighboring Pattani province. Police Col. Patta Madawa said the most recent device, which resembled a pipe bomb with fins, fell into the living room of a house and was defused by demolition experts, according to the Associated Press. “PULO tried to develop a kind of rocket-powered grenade or rocket for remote attacks, but we do not have any evidence yet whether it worked,” the anonymous counter-terrorist official said. “We are interested in where they were built. The projectiles have slant noses made by way of a tube serrated, cut and welded to make a solid nose,” he added. While ballistics experts have not identified the propellant used, the bomb is described as an improvised explosive device that contains ammonium nitrate and fuel oils. “The detonators were rigged using gun primer and a firing pin. They had some flaws and did not ignite,” the official said. On Jan. 30, officials in Pattani’s Nong Chik district found two unexploded rocket-like bombs and were told that three others had been fired. The bombs in both incidents were emblazoned with the PULO flag. An ex-PULO member, Ma-ae Sa-a, linked the bombs to his former group. “I told the authorities that the name Nampra Army with the PULO flag is real,” he said, adding that PULO was more likely to have planted the bomb than launched it as a projectile. The Nampra Army, a faction of PULO, issued a statement warning those living near military camps in Pattani and Narathiwat to move away because it planned to attack the camps with rockets this year, hamptani.com reported. According to Lt. Gen. Nanthadej Meksawat, a retired intelligence officer who was assigned to the Deep South, the introduction of the rockets shows that PULO is changing tactics because of its growing weakness. “The capability of the operational militants became weaker,” Nanthadej told BenarNews. “In recent months they tried to avoid direct confrontations with security forces. Last year, we saw bomb attacks followed by gun attacks. We saw direct gun attacks and shootouts. This year, we don’t see this,” he added. The discovery of the new weapons, nonetheless, has alarmed locals in the Deep South, which has seen more than 6,000 people die from violence related to the insurgency since 2004. Nimu Magaje, former chairman of the Islamic Committee in Yala province, said authorities should prevent rebels from using these rocket-type weapons in attacks. “People are frightened and have spoken out in the community. It is a mission of authorities to prevent the violence,” Magaje told reporters on Monday.